Dave Merrington didn't quite make it to 100 league appearances in his football career, but he can boast having the England team play at his testimonial and, at the age of 70, at the time of writing, he's still very much involved in football working for BBC Radio Solent. Despite his long association with Southampton on the south coast, Merrington is very much a Geordie who left his native Newcastle for Burnley in the early 1960s and after serving his apprenticeship was rewarded with a professional deal in 1962 shortly after his 17th birthday. He'd been a centre forward in schoolboy football but Burnley converted him into a centre half where he settled in well and progressed through the junior teams to become a regular reserve team player in the 1963/64 season. Sammy Todd and John Talbut were ahead of him for the first team as partners for Brian Miller, but just two days before his 20th birthday, he was given his chance in the last game of the 1964/65 season at home against Chelsea. The Clarets won that game 6-2 against a Chelsea side chasing the title but without several top names who had been sent home by Tommy Docherty for breaking a curfew. He played well but despite that there was still no regular place for him in the team. He played occasionally over the next two years but by the end of the 1966/67 season things were looking brighter for him personally. Talbut had been sold to West Brom during that season and a ruptured anterior cruciate ligament had brought Miller's playing career to an end. Merrington started the next season in the first team with hopes of being first choice, but by October of that year there was another rival in new signing Colin Waldron. Even so, he started half of the games in that 1967/68 season, his best ever return. Waldron went on to be appointed club captain, but having been disciplined by the club he was stripped of that captaincy with Merrington taking on the role short term despite not always being in the team. For three years he was in and out of the side but in March 1969 he scored the winner in a 2-1 home victory against Man City. It was his only league goal for the club although he did score a second Burnley goal in September 1970 against Hearts in the Texaco Cup. By that time his playing career was all but over. Waldron's central defensive partner was now either Jim Thomson or Martin Dobson and when Merrington did play it was out of position at left back. Jimmy Adamson's first full season ended in relegation with Merrington playing his last game in January 1971, at left back, in front of the Match of the Day cameras against Man United at Old Trafford, a game that ended 1-1 with Dobson scoring our equaliser. With Burnley facing Second Division football, Merrington was one of the players released and he signed for Bristol City, presumably hopeful of playing against Burnley in the forthcoming season. Unfortunately it wasn't to be. Merrington had played 98 league games for Burnley but he wasn't able to add any more to that total. He started to suffer with tendon problems and was never able to make a debut for his new club, but they did give him a testimonial as well as a coaching role. Over 7,000 turned up for the testimonial game as Bristol City took on the England 1966 World Cup squad. After three years at Ashton Gate he returned to Burnley as reserve team coach under Adamson and worked with his fellow Geordie for the next few years, moving with Adamson to Sunderland and then Leeds, acting as caretaker manager at both clubs when Adamson departed. But Adamson's sacking at Elland Road saw him out of work for the first time and he turned towards the ministry. 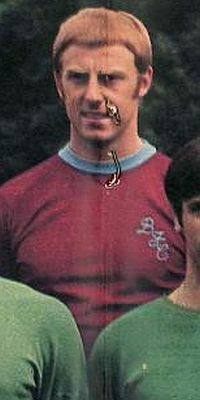 Merrington had become a lay preacher whilst a player at Burnley and now set about training to become a church minister. Who knows, that could have been the end of his time in football, but the calling came from Southampton manager Lawrie McMenemy who asked him to become the youth development officer at the Dell. He continued in that role as Chris Nicholl, a former Burnley team mate, Ian Branfoot and Alan Ball became manager in turn, but when Ball left in the summer of 1995 he was offered the manager role himself. They struggled but survived on goal difference ahead of Man City with 38 points. That wasn't good enough for the Saints board who immediately replaced him, bringing in Graeme Souness who himself only lasted a year. Merrington left the club after being sacked as manager, but returned a year later to work for Dave Jones who had replaced Souness. This time he was there for just three years before losing his job again with the appointment of Glenn Hoddle as manager. He later had a brief time working alongside Colin Lee at Walsall, but that was his last job working with a football club. Since, he's turned to media work and has worked as co-commentator and summariser on Radio Solent for over a decade covering the Southampton games. He was featured very heavily recently in a Sky programme on Matt Le Tissier who heaped praise on Merrington for the work he'd done within the youth set up at Southampton and pointed to him as one of the biggest influences in his career. Le Tissier spends most Saturday afternoons these days in the company of Jeff Stelling, Paul Merson, Charlie Nicholas and Phil Thompson on television but Radio Solent told me today that he has so much affection for Merrington that he's the first person he goes looking for when he does attend a game at St. Mary's. They also told me that Merrington always looks forward to Burnley v Southampton games at Turf Moor which give him an opportunity to visit his first club. As a player, Merrington struggled to nail down a place in a First Division team but he's gone on to manage at the top level, help progress the youth system at Southampton, bringing through some excellent players, and even at 70 is ever popular with his work on local radio. I only once spoke to him; that was at school when he came to talk about his life as a lay preacher, but a talk that was mainly, in the end, about football. Asked by one boy in the class how he could go kicking hell out of a footballer the day before he climbed into the pulpit, he just said: "Because that's my job."